On December 10, 1869, Wyoming became the first state in the Union to grant women the right to vote. Continuing with the pioneering tradition, 2 Wyoming women — Wyoming Supreme Court Chief Justice Marilyn Kite and her sister-in-law Karey Stebner — dreamed the concept of the 1st Annual Wyoming Women’s Antelope Hunt. Just as Wyoming led the way in the women’s suffrage movement more than a century ago, the hunt organizers and founders hoped to do the same for women and hunting in the Equality State. For 70 years Wyoming men have held their own “One Shot Antelope Hunt,” but instead of bragging rights and a team race to shoot the most antelope with a single round in the shortest time, the inaugural women’s event had an entirely different goal. The sisters not only wanted a way for women to enjoy the experience of hunting pronghorn in Wyoming, but they also wanted to make an impact on the women in their state by raising funds for the Wyoming Women’s Foundation (WYWF). Teaming with Richelle Keinath, Rebekah Smith, Kathryn Boswell, Beth Worthen and many others of the WYWF and Wyoming Game & Fish, more than 30 women hunters from all walks of life made their ways, despite the threat of impending blizzard conditions, to The Ranch at Ucross. The Ranch’s Vickie Abbott and Eric Wilhelm worked tirelessly with generous landowners, guides and meat processing vendors to make the experience one the women would never forget. When it snows … it snows! Lush greens from a wet summer and the bright golden hues of cottonwood trees greeted us as we arrived at Ucross. At registration, each hunter received a set of beads to wear proudly — blue for those with experience and red for those new to hunting. Next, Wyoming Game & Fish gave a safety presentation along with important information on proper tagging procedures in Wyoming. Women also had the opportunity to sight in rifles. Sighting in her Smith & Wesson M&P10 at the range before the antelope hunt. Everyone enjoyed a delicious welcome barbecue in the huge tent that would serve as the meeting place for dinners, the Saturday night auction and special events throughout the weekend. At the dinner we had the chance to meet one another and learn more about our hunting partners. We also met our guides and discussed the game plan for the next day, although no one imagined what a day Friday would turn out to be. The following day, at 5:30 a.m., the power went out and a quick look outside showed almost whiteout conditions. Authorities shut down Interstates and closed schools as we trudged to the main house for a breakfast by candlelight. Braving the horrible road conditions, the guides (all men) made their ways to the ranch, most thinking we would spend a day inside near a fire, sipping hot tea and telling stories. Instead, they found our hunting packs scattered around the floor and women bundling themselves in their warmest camo. We came to hunt! Danielle Sanville, of Smith & Wesson, shot the first buck, at 49.5 yards. 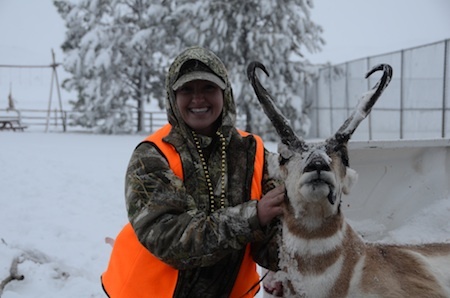 At the end of the weekend her shot earned her the Super Stalker Award, a beautiful bronze antelope bust trophy. Despite blizzard conditions, more women returned with their pronghorns tagged throughout the day, sharing their stories and smiles. The contagiousness of the day’s excitement carried through to the auction. First Lady Carol Mead, Representative Cynthia Lummis, and other prominent Wyoming citizens had been scheduled to attend, but weather and political duties kept 2/3rds of the guests away. Those who could make it joined us as we participated in raffles, and enjoyed a silent and live auction with donations from generous sponsors. 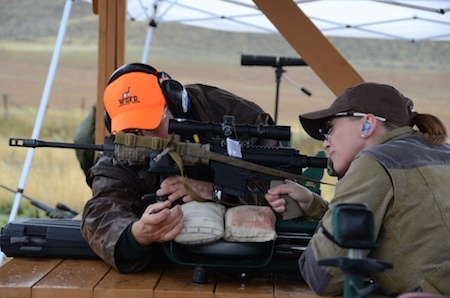 The mission resonated with many of the new hunters, like Wyoming resident Lynn Green, a combat veteran whose experience at the hunt is one she will never forget. After taking her first shot on an animal, she now looks forward to sharing hunting with her young son. The WYWF recognized her and 7 other women as first-time hunters. They each received the Diana Award. California vegetarian Kristy Scott will no doubt remember this hunt, too. Kristy served as an example of the women whom the WYWF hopes to reach. A mom who wanted to learn a way to provide healthy, organic food for her children, Kristy received the Boone & Crockett-sponsored Roosevelt Award. The Roosevelt Award celebrates an adventurous spirit, determination, self-reliance and the need to give back more than that taken. Brilliant blue replaced snow-filled skies on day 2 of the hunt, as the remaining hunters, with the help of their experienced guides, spotted, stalked and low-crawled to fill their tags. Thirty-two of the 34 women earned another set of beads representing their successes. Those who took multiple shots on their game received pearls. For the 28 hunters who took their pronghorn with a single shot, they received gold and also Annie Oakley awards. The women participated in other activities while there. They had the chance get artistic with paints, bust clays with shotguns and learn how to process meat from their pronghorns. One of the hunters and professional taxidermist Charlotte Wilsey-Catlin of The Wildlife Gallery gave an impromptu demonstration on how to cape and I offered a Field to Fork cooking demonstration, making Venison Pho. After a final breakfast, Sunday morning we all packed up our guns and gear, and made our way home. It was hard to believe it was over, but to all, the hunt represented incredible success. The avid hunters shared their knowledge and passion for hunting. For others, the WYWF planted a seed to make hunting forever a part of their lives. No doubt though, the first Wyoming Women’s Antelope Hunt represented a celebration of women coming together, mentoring and creating relationships that will last lifetimes. To read more about the hunt check out these articles and visit WyomingWomensAntelopeHunt.org.